This soundbar is amazing! In a word, this is a fantastic soundbar, which brings so much fun to you and your family, couldn't ask for a better product, you won't regret it. Wireless Connection: This soundbar can quickly connect to your phone, tablet, laptop and any other devices via Bluetooth 4.2 or NFC pairing, you can enjoy the CD-like quality sound without any distortion, gives you the best music experience. All accessories included include original BOX. Working like new. Model: A3145011. Model SoundCore Boost. Wireless Technology Bluetooth. Bluetooth Yes. Bluetooth Range 66 ft. Type Portable Speaker System. We are not responsible for electronic incompatibilities. Trending at $105.32eBay determines this price through a machine learned model of the product's sale prices within the last 90 days. SAMSUNG HW-M550/ZA 340W 40 inch SOUND BAR with powerfull Subwoofer. Sub woofer. You'll feel it. Bluetooth connectivity lets you fill the room with your favorite music. The main photo is generic from Samsung. Samsung HW-M550 Soundbar. Spk (sub woofer) Net Weight. Number of Sound Modes (DSP) 5 (Standard, Music, Clear Voice, Sports, Movie). 5 out of 5 stars - SAMSUNG HW-M550/ZA 340W 40 inch SOUND BAR with powerfull Subwoofer. 1 product rating1 product ratings - SAMSUNG HW-M550/ZA 340W 40 inch SOUND BAR with powerfull Subwoofer. Trending at $130.00eBay determines this price through a machine learned model of the product's sale prices within the last 90 days. The BT speaker made of premium material for durable and practical use is with unique appearance and high quality sound effect. Besides, it is a light weight and with mini size, you can take it with wherever you go. Model R1280DB WOOD. Edifier’s Classic Speakers Just Got Better. Newly added inputs such as optical and coaxial inputs upgrade our standard set of speakers into full HD set of bookshelf speakers. With the new additions, we have also left the RCA connections in tact for keeping the option for RCA or AUX connections. Paradigm Monitor 3 v.2 High Definition Speaker System Pair Sequential Serial #'s - Black Grill Cover. We are excited for you to receive your item! Dedicated center channel for clear speech. add optional Samsung SWA-9000S wireless speaker kit for full surround sound. SAMSUNG HWMS650/ZA. Wireless Music and TV Sound Options 5 listening modes: Music, Movie, Clear Voice, Sports, and Night Mode. Wirelessly Stream all your favorite music services like Amazon Music, Pandora, Apple Music, and Spotify. Connect your Play:1 to any Amazon Echo or Alexa-enabled device, then just ask for the music you love. A line level input is provided for fast and easy connection to virtually any system. Don't hesitate to buy it! Also, to conserve energy, the subwoofer will power off after a long period of inactivity. Subwoofer enclosures are not covered by Techronics' warranty. APO/FPO, Virgin Islands, Guam and All Other U.S. Territories. Burnt voice coils. All defective products will be covered under warranty except the following. Pair of used Bose redline double cube speakers. Function properly. Housings have and grilles have minor wear. Trending at $619.97eBay determines this price through a machine learned model of the product's sale prices within the last 90 days. Acoustic Audio 251W Indoor / Outdoor White Weather Resistant Speaker Pair. The Acoustic Audio 251W mountable or bookshelf speakers are the perfect solution for any occasion or application because they are water-resistant and can withstand all weather conditions. Excel To HTML using codebeautify.org. Set-up could not be easier! – Simply plugging the pre-out or sub-outputs into the SubCast transmitter input and then plug the receiver module into a subwoofer input, amp, receiver or powered speakers - and power it up! Woofer: 2x 5.25"" Kevlar woofers with 10 oz magnets. In either case, it's a win-win situation for those who desire high fidelity and those who put emphasis on decor. Mounting Depth: 3.1""". You can fine tune the blend of sound using the built-in high frequency attenuator in case your room is too bright. I haven't tried Bluetooth yet. Jaybird64, March 11, 2018. FM Radio Ability. Small price, Big sound! Condition is Used. Te st ed w or ki ng. 1000W total power. Connect multiple devices using the receiver's included HDMI and audio inputs. Bluetooth capability allows you to stream audio from other Bluetooth-enabled devices. Dolby Digital 5.1 channel. Trending at $217.41eBay determines this price through a machine learned model of the product's sale prices within the last 90 days. Class "A" Certified Refurbished like new w/ Warranty. Surround Sound Expansion lets you experience the full power and depth of your favorite movies and TV shows with a wholly optimized audio experience. TV SoundConnect lets you instantly enjoy movies, music, and TV shows with clearer, more impactful sound. Hiding inside its elegant exterior is the secret: Two internal subwoofers that are paired with four deep bass modules for that deep, robust bass. 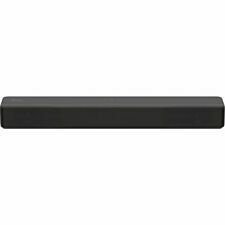 Compact and versatile, this sound bar is perfect for rooms with limited space. 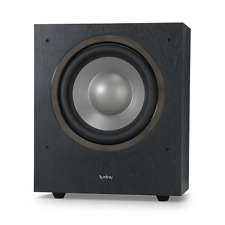 Add impact to your favorite movies and full-bodied bass to your favorite tunes. It features a high-current, 300-watt amp which effortlessly drives its down-firing 8" woofer for dynamic low-frequency effects. Improving on its famous sibling’s pop-culture appeal, the SoundSticks III system is all that and much more. Taking its older sibling’s celebrated design even further, the SoundSticks III look is cutting-edge with a modern industrial design aesthetic, elegant black accents and a luminescent white LED glow. 5W Fashion Speaker Sound Bar Wired Subwoofer Soundbar Speakers Stereo Super Bass Loudspeaker for Phone PC Computer Specification: Power Output（R.M. Sonos One 1st Gen - Open Box. 1017JX ONEG1US1BLK. Open Box, Like New, Factory Reset and Ready to go. Trending at $162.49eBay determines this price through a machine learned model of the product's sale prices within the last 90 days. Acoustic Audio AA251W Indoor / Outdoor White Weather Resistant Speaker Pair. Indoor and Outdoor Speakers. The Acoustic Audio AA151W mountable or bookshelf speakers are the perfect solution for any occasion or application because they are water-resistant and can withstand all weather conditions. Cerwin-Vega CLS-6C Center Speaker. Condition is Used. Shipped with FedEx Ground or FedEx Home Delivery. For more info on this woofer, see below. Power Handling (RMS) 120 Watts (each woofer). Power Handling (max) 240 Watts (each woofer). Voice Coil Inductance (Le) 1.15 mH. Sealed F3 40 Hz. Product Specifications.